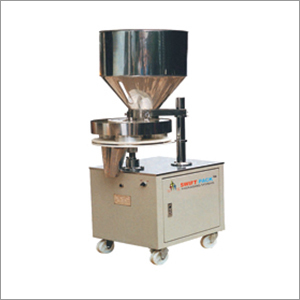 We are Delhi Based 'Granule Filler' Equipment manufacturer, and supplier. Leveraging on our fabrication facility, we are able to design and make the granule filling machines in two models, having the capacities of 250-500 ml and 500-1000 ml, respectively. It is integrated with salient features like to performance weighing controller, simple operation, easy installation, quicker sampling, and different capacities viz 35 bags/min and 40 bags/min. The most profound and common use of our granule filler is in the bulk packing of granule material in chemical industry, feed, cereal, and foodstuff domains. Different types of bags that can be used in this machinery are stand-up bags, zipper bags, spout bags etc. The machines are designed as per the latest industrial requirements and trends, which are updated to us by our research experts. The bag is clamped by the worker (manual process), after which weighing and filling are done automatically (in this order only). Then, the bag is conveyed automatically for quick sewing.